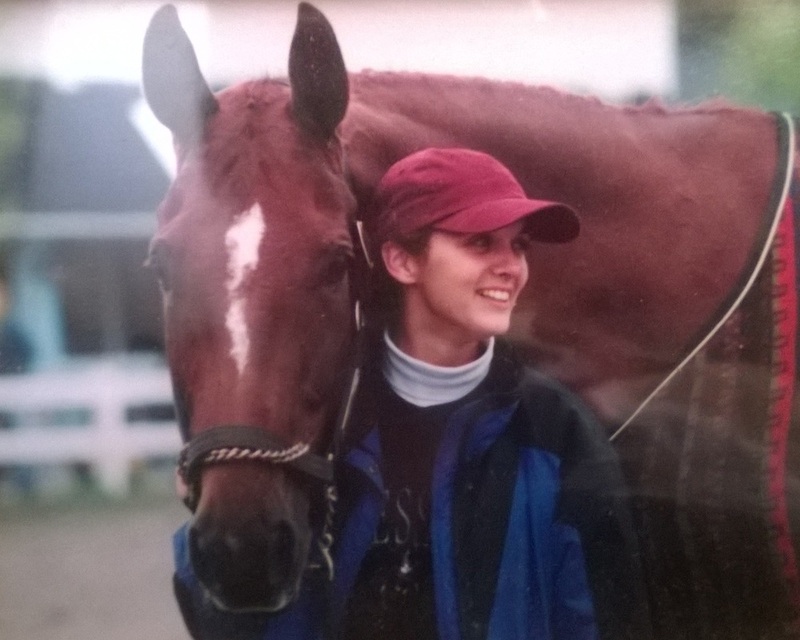 Dr. Amy Ortez grew up spending most of her time in and around barns outside of Philadelphia, PA. After spending many years working in various aspects of the horse industry, Amy made the decision to attend veterinary school at the Atlantic Veterinary College on Prince Edward Island, Canada. Since graduating, Amy has made her home near Rochester, NY where she is a mixed animal practitioner. There is no aspect of equine medicine that does not interest her. Amy is also the proud owner of several horses that she enjoys riding. The fantasy of warm weather and hours of riding bliss is thwarted by the reality of biting insects and sweating man and beast. This defines summer. Biting insects come in many forms and each time of the day has an insect looking for a meal. ​The Zika virus has increased mosquitoes' publicity but they have always been a worrisome vector of disease in horses. The average female mosquito only weighs 6 mg but they can potentially carry a number of viruses that can be deadly. Horses (and humans) are susceptible to Eastern, Western and Venezuelan Equine Encephalitis as well as West Nile virus. Horses are considered “dead end” hosts which means that people are not at risk if a mosquito bites an affected horses and then bites a human. Like humans, horses that are bitten might be itchy at the site of the bite. Mosquitoes like to be out at dusk and dawn. The deer fly, and horse fly have painful bites. The horse fly is the big, huge fly that likes to land on the rump and inevitably cause your horse to buck just when you relaxed and dropped the reins. The deer flies bite on the legs and underside of horses but will bite any where available. 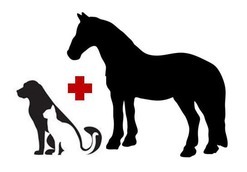 They can cause equine infectious anemia (the disease Coggins test assess). These daytime predators do not like dark areas. 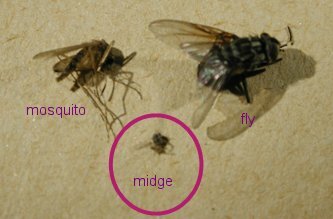 House flies and stable flies invite themselves into the barn and feast on the legs and face of horses. They too can cause equine infectious anemia and prefer to eat during the day. Controlling these pesky pests are challenging. Many people do not like using chemical repellents since they seem to work for a few minutes, not the hours or days professed on the label. Fly sheets, masks and leg wraps are great as a physical barrier but if a bug enters them and is unable to find the it's way out, they can cause the horse distress. Clay poultices are helpful physical barriers that horses enjoy but are messy. Offering horses shelter with a fan is a great way to keep them cool, bug free and happy during the dog days of summer. The Culicoides midge (commonly known as gnat or No-See-Um) is responsible for sweet itch. This is a hypersensitivity to the bite that causes horses to be extremely pruritic or itchy. The midges tend to bite on the mane, tail, and dorsal and sometimes ventral midline. Like the mosquitoes, they prefer early morning or late evening but will also hang out during the day if the wind is calm and it is cloudy. Ticks don't cause horses the immediate distress that the biting flies create but they do cause diseases such as Lyme disease, tick paralysis (Australia), Anaplasma/Ehrlichiosis and Rocky Mountain Spotted Fever. They are most commonly found in wooded areas, tall grass, brush and shrubs. 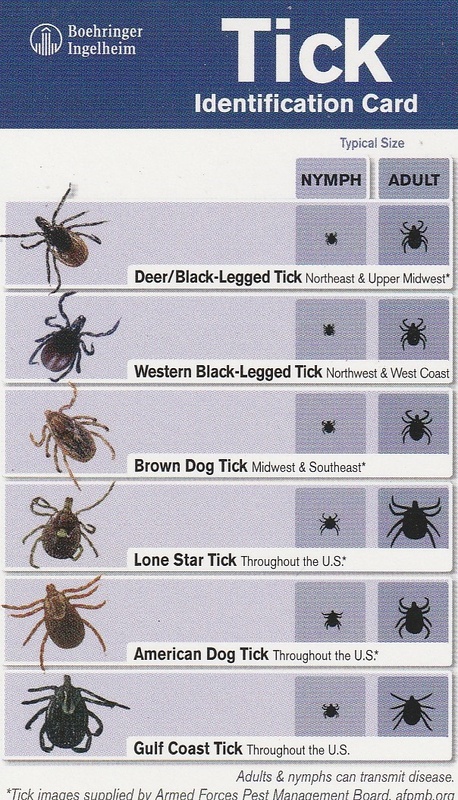 Click on the Tick Identification Card to view a larger, printable version. My mustang, Neeheewanna, was rubbing herself raw, literally. Her mane was gone, the dock of her tail was bare and cracked. She rubbed incessantly. I had never had this with any of my other horses or mules. After having the vet come out and taking some skin samples to eliminate causes, the end determination was sweet itch. I was given a prescription shampoo to use on her to relieve her symptoms. It really didn’t seem to help at all. The following year, same thing. This time I was telling my friend about it and she recommend Equi-Spa™ Not So Sweet Itch Gel Formula. She had been using for her horse and swore by it. Now I know why! The Not So Sweet Itch Gel Formula reduces, if not eliminates, mane and tail rubbing. According to Equi-Spa™, “It soothes and moisturizes the skin and hair of the mane and tail to reduce rubbing due to dry itchy skin and promote new hair growth.” Not So Sweet Itch Formula is a special blend of soothing witch hazel and moisturizing coconut oil blended with pure essential oils in a relieving organic aloe vera gel. These oils also have some properties that help with hair regrowth while moisturizing dry skin and hair. Gentle enough to use on sensitive areas. Not So Sweet Itch Gel really performs just as Equi-Spa™ claims. It relieved Neehee’s symptoms, the rubbing decreased and her raw, cracked skin healed. As she healed, her hair started to grow back in a noticeable amount of time. The prescription shampoo I tried previously, did not relieve the itching, nor did it heal her skin or promote hair regrowth. I now make sure to have this as a staple in my barn. I never want my horse to experience the pain and discomfort she endured from sweet itch again. Note: This is not a paid advertisement. This review is based on my own personal use and experience. I love spending time at the barn or being anywhere with our horses and mules. We spend a majority of our time outdoors with our animals, gardening, hunting, fishing or just enjoying nature. I prefer to spend my time focused on what is going on around me, rather than focusing on the biting insects and pests that seem to plague us from Spring through Fall. At the barn we have had wonderful success with Spalding Fly Predators®. According to Spalding Labs, “The House Fly (80%) and the Stable Fly (20%) are the primary pest fly species that create problems as well as being the most widely distributed.” Both of these can be very effectively controlled by good sanitation and Fly Predators®. Fly Predators® are the natural enemies of flies, but never bother people or animals. They kill flies before they emerge. Spalding Labs makes using their Fly Predators® seemless. On their website (www.spalding-labs.com), they walk you through a series of questions to determine the optimum number of Fly Predators® for your farm, herd and geography. They ship them monthly based on your climate, so they always arrive at the correct time to disperse them on your property. Essential Oils (reference February Issue for All Essential Oils are NOT Created Equal) are a natural way to repel flies and other bothersome pests. 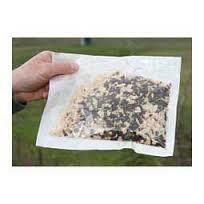 There are a multitude of fly repellent recipes using essential oils that you can find on-line. My opinion is, most are a matter of preference. Some call for apple cider vinegar. I personally do not want to smell like vinegar all day, nor do I want my animals to. My one horse didn’t like the scent of Citronella. While Citronella is an excellent fly repellent, I didn’t want to use something on him that he had an affinity to. Basil, Cedarwood, Citronella, Eucalyptus, Geranium, Lavender, Lemon, Lemongrass, Peppermint, Purification, Rosemary, Tea Tree and Thyme. Apply directly neat (February Issue), if safe. Again, read your labels on each oil prior to use for safe application. Essential oils can also be used to repel ticks. Some essential oils not only repel insects, they also boost the immune system, contain anti-infectious and anti-viral properties as well. Geranium – has natural insect repellent, antiseptic and anti-inflammatory properties. Gentle enough to use with direct application. Palo Santo – has anti-infectious, anti-viral, immune-stimulant and insect repelling properties. Very effective in removing ticks. Research was done proving that Palo Santo will kill a tick within 15 minutes of application. Compared to Peppermint where the tick was still alive two weeks after application. Rosewood – has antifungal, anti-infectious, and anti-parasitic properties. It is also good for fungal skin conditions. Thyme – has antifungal, anti-infectious, and anti-viral properties. It is one of the best oils for preventing infection and boosting the immune system. Myrrh – has anti-infectious, antiseptic and anti-parasitic properties. Other oils that repel ticks are: Cedarwood, Citronella, Eucalyptus, Juniper, Lavender, Lemongrass and Peppermint. To remove a tick, place 2-3 drops of Palo Santo directly on the tick and wait for the tick to let go. Peppermint, Cinnamon Bark, Thyme or Oregano can also be used, but will not kill the tick. Once the tick is removed, immediately apply anti-infectious, anti-viral and immune stimulating oils such as Thyme, Oregano, Clove, Tea Tree or Thieves. Before using essential oils on your animals, you should make sure to read the individual labels of each oil you intend to use. Some essential oils are “hot” oils (February Issue) and may need to be diluted with a carrier oil (February Issue). Other essential oils (like citrus oils) can cause photosensitivity, so caution should be heeded when using them if you or your animals are going to be outside in sunlight. Many essential oils can be used with direct application (March Issue) to help repel pests. Expose your animal to each individual essential oil prior to using it on them (April Issue) to see if they are accepting of it. Natural insect repellent needs to be reapplied frequently for best results. is meant for educational and informational purposes only. When in doubt, consult your veterinarian.